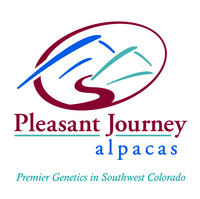 Pleasant Journey Alpacas: The Juvies Win Big! Altitude take a Blue in Fleece! FallFest 2011 was a big event for Pleasant Journey Alpacas. We took three juvies, Aerie, Tiffany and Dillon, to their first show and what an adventure. We stopped along the way from Arizona to Loveland, CO at our own ranch in Hesperus, CO for two nights. This gave the three little ones a taste of cold Colorado fall nights and it appears that they loved it! They enjoyed chowing down on a little fresh grass still in the pens and got the treat of a little fresh alfalfa! YUM! The venture to Loveland was, fortunately, uneventful. We do not like surprises on the road. Aerie, Tiffany and Dillon were little champs all along the way. They behaved beautifully in the stalls but more importantly, they were stellar in the show ring. We would have loved more competition but found that being in Arizona and on a different breeding schedule than most of the country meant that there were not many juvies at FallFest 2011. Oh well! 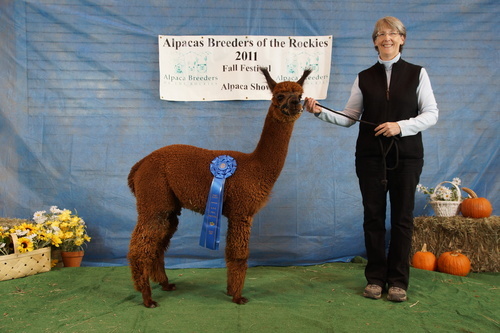 However, Dillon garnered the praise of Judge Amanda VandenBosch with his lovely fiber and took home a BLUE ribbon. Tiffany had the most competition in the beige/light class with 4 in her class. 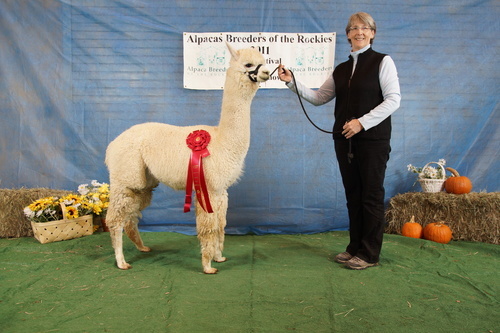 She impressed Judge Polly Michaelis with her size, stature and fiber to take home a RED ribbon. 8 month old Aerie, first offspring from our proud herdsire Altitude was also in a class by herself. This is the girl we really wanted to see with competition. Aerie holds the traits of Altitude with her proud upright show stance and pose. Judge Polly Michaelis was wowed by this little girl and gave her high praise for her stature and her fiber. BLUE ribbon! 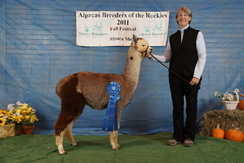 Champion herdsire Adonnis Altitude NS was also at the show but not shown in halter. His third year fleece was entered in the fleece show and won a BLUE ribbon! This guy continues to improve with age. We are looking forward to GWAS to enter three of his offspring for "get of sire" for Altitude. Should be quite impressive. Everyone is back in AZ and enjoying the nice fall weather. 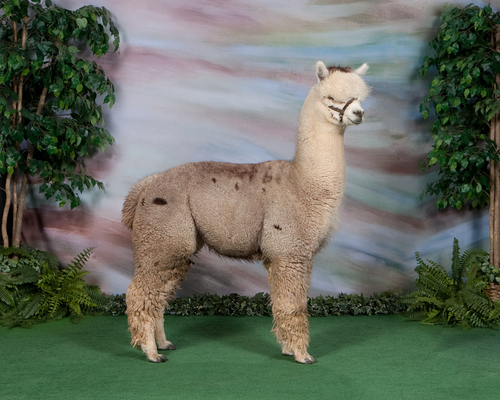 We are all looking forward to the arrival of 8 new cria between November and May. Keep watching for news on the new little ones (4 of which are sired by Altitude). Happy Holidays to all! Check out our Holiday Breeding special for Adonnis' Altitude NS!